THINKWALKS » Carl Nolte is Secret Love Child of Father Palou? Carl Nolte is Secret Love Child of Father Palou? 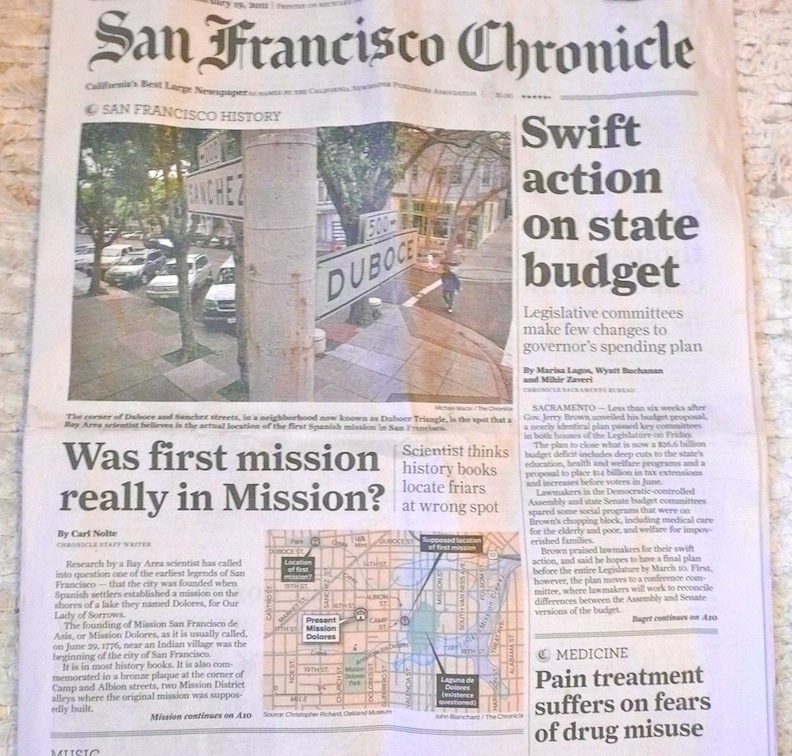 New rumors about Mission Dolores history have hit the papers! In addition to Hadley’s post at Mission Local, mentioned in my previous entry, which breaks the story with a perfect synopsis of the latest research, Carl Nolte has, over the weekend, published an article printed on real paper—front page above the fold and in color in Saturday’s Chronicle. 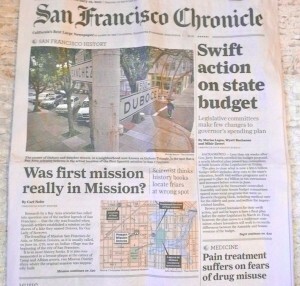 It’s a little confusing, since the headline, along with the map Nolte presents and the article itself all incorrectly state that the Mission may have been founded north of Market Street near Duboce Park. Researcher Christopher Richard corrects the record in the web comments, but all the people who see this in print face yet another incorrect version of a founding myth for our city! This is such a perfect illustration of how it happens that blatant untruths become widespread beliefs. It’s both thrilling and excruciating to watch this play out. From my rickety perch, it seems that Nolte simply failed to tease out the specific nuance that makes all the difference: It wasn’t the Mission itself that began at Duboce and Sanchez. It was the waterway first called Dolores that began there, and was first sighted there at what is now Duboce and Sanchez. And it was the spot where Anza likely stood when he picked the Mission’s future location. There’s a huge difference between Anza’s “Let’s put it near this great water supply,” and Nolte’s version where Father Palou is imputed to have put the first (temporary) mission in that exact spot a few months later. In a way, Nolte’s inaccuracy is the same sort of difference as Palou’s original inaccuracy about a pond. Palou started the whole confusion by being unclear in his writings (or in his mind) about what water was named ‘Dolores’ and what constituted a pond. Palou’s confusion then combined with the fact that Anza mentioned a freshwater pond (located in what’s now the Marina District, at the north end of the eponymous Laguna Street) to create the enduring myth (The Mission was founded on the shores of a now-gone freshwater lake) that Christopher and I are now working so hard to bust. It’s exhausting. And Nolte’s not helping. Nolte, Nolte, is it true? You’re the kin of Pa Palou!? Both articles came out of the talk I gave at the SF History Association monthly meeting in January. Hadley Robinson and Carl Nolte both attended and went on from there to investigate, more or less. Christopher Richard (of the Oakland Museum of California) was their main source because he did pretty much all the research, with myself, Janet Sowers, and a few others giving bits of feedback and photo evidence here and there. The topic had already been on my mind when I heard Christopher’s doubts at an Ask-A-Scientist event a year ago. I was so glad to find someone besides myself that doubted the existence of the freshwater lake in the myth, I have been egging Christopher on, promoting our conclusions and discussing the accumulated evidence with him on a regular basis. To have the “mainstream press” cover it is a breakthrough. And to have it covered so inaccurately is a heartbreak. One of my Thinkwalks covers this topic in depth. The Water Walking tour is one of my most popular tours, despite being uphill and almost four hours long. In it, we look at the evidence for various interpretations of Mission history, along with other topics about streams, drinking water, aquifers and wells in San Francisco. The people who come on the tour are often folks who work with water or are educators themselves. Of course, my post is about the siting of Mission Dolores, just as Hadley and Carl’s are.